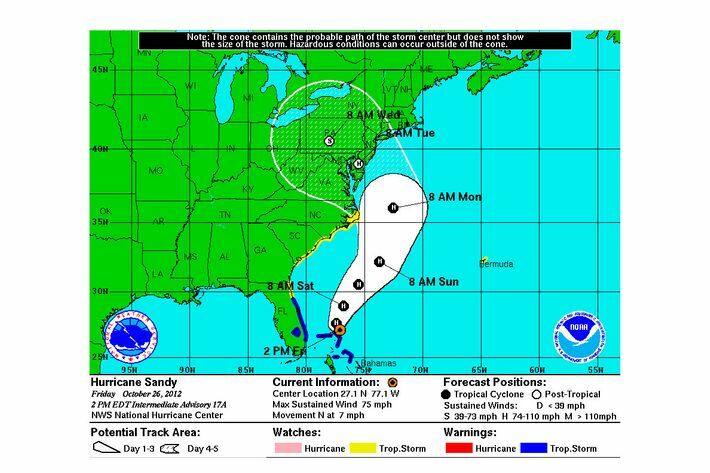 Hurricane Sandy's track as of 8 a.m. this morning. As Hurricane Sandy barrels its way toward the Northeast, where it will meet up around Tuesday with about 40 other storms to create a Frankenstorm which produces an absurd list of weather phenomena — including “heavy rain, high winds, flooding, tornados [sic], coastal surges and possibly snow,” according to the AP — some New Yorkers must be thinking, There’s no way this is going to live up to the hype. Didn’t we expect more from Hurricane Irene last year? Doesn’t this kind of thing always fizzle out in the end? Should I really trust the media-meteorological complex? The name 'Frankenstorm' has been coined by some meteorologists and media.We are refraining due the severity of the storm. Fair point. We could always go with SNOREASTERCANADOTRON (all caps). 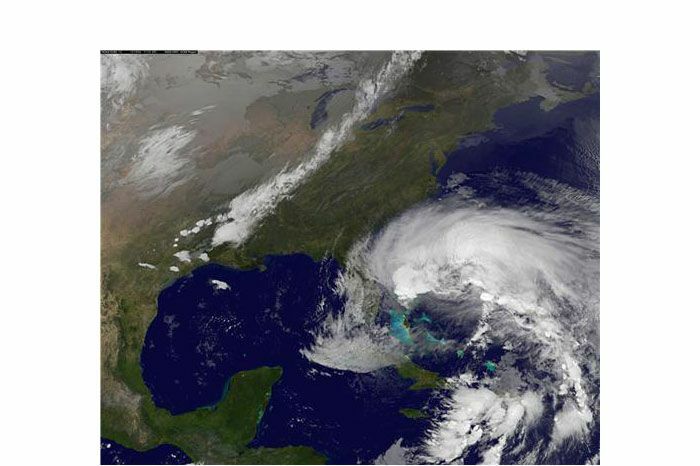 Update: That’s Hurricane Sandy coming up from the South, and some other nameless storm thing coming in from the West. When they meet … Frankenstorm. Update II: New Jersey has issues its first mandatory evacuation orders. If you live in Cape May County, time to head to high ground. Update IV: Mayor Bloombeg will be giving an update on the city’s preparations at 3 p.m. this afternoon. Also, not that this really concerns you, but exterior construction work has to stop by 5 p.m. tomorrow. Update V: If you’re relying on Netflix to entertain you through the Frankenstorm, better get a back-up plan. 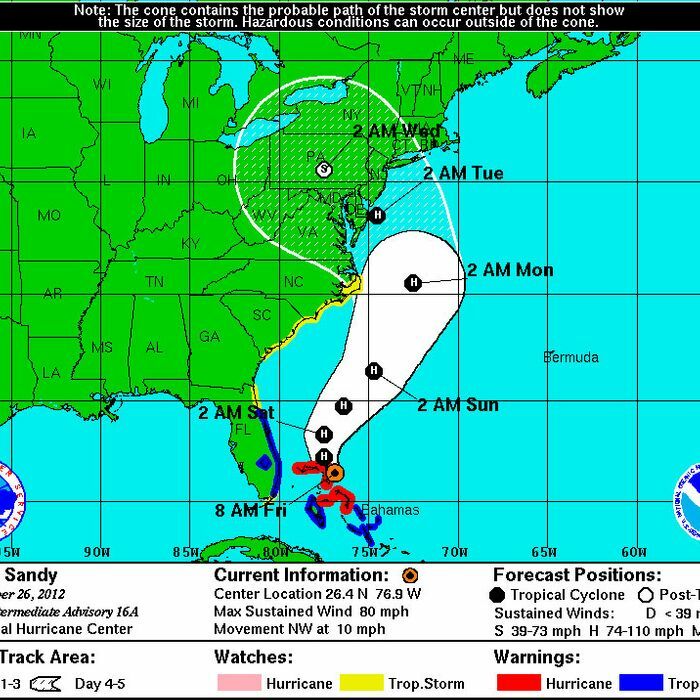 Update VII: Here’s the 2 p.m. forecast from the National Hurricane Center. Not that much different than the earlier one. Update VIII: “Whenever or however or wherever the storm comes ashore, our city is likely to feel its effects,” said Mayor Bloomberg this afternoon, but just how bad it will be, no one can be sure. “We are so far from the main event that you just don’t know,” he added, indicating that the next updates from the city can be expected later tomorrow. As of now, no evacuations have been announced, but the mayor urged people to stay out of city parks on Sunday. Update IX: More subway prep: The MTA has boarded up subway grates in various "low lying" areas around the city to help prevent subway flooding. Spokesman Aaron Donovan confirms that the same thing was done before Hurricane Irene last year. 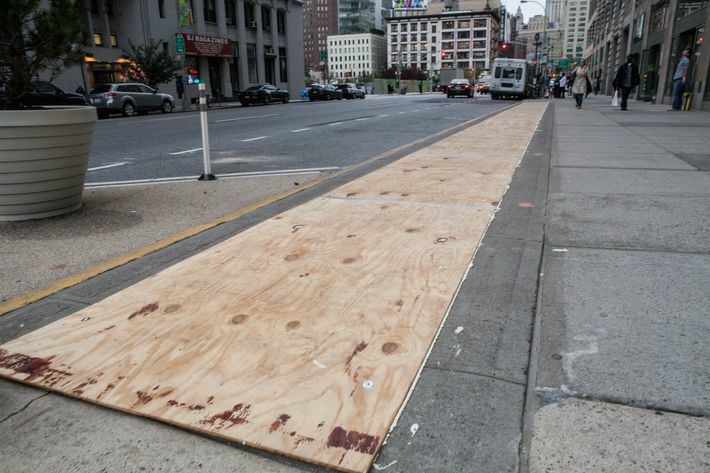 The view of the sidewalk outside the New York office.